Micromanagers like to “prove” that their approach works with a simple experiment: they give an employee an assignment and then disappear until the deadline – in other words, they stop managing altogether. An exceptionally confident employee may welcome the respite from constant oversight and run with the assignment — but that is not the case with most micromanaged workers. Micromanagers erode their workers’ self-confidence. Micromanaged workers become tentative; having learned that nothing they do by themselves is ever good enough, they become reluctant to make decisions on their own or take any action without direction or approval. The manager’s experiment with withdrawing all management leaves them floundering. As a result, they do one of two things: either (a) they go to the manager to ask for direction before the deadline or (b) they struggle along to the deadline without any managerial support and come up with inadequate results. In either case, the micromanager sees “proof” that without constant intervention workers flounder or fail. Assuming you are getting the message that micromanaging is generally not good for your people or the health of your organization, don’t rush headlong into a commitment to stop micromanaging cold turkey. That probably won’t work anyway; ingrained habits are hard to break. It can be helpful to understand your micromanaging behavior better before making changes. Use the 5 Ws – who, what, when, where and why – to gain a better understanding of your micromanaging behavior. Some managers simply micromanage everyone. Not all micromanagers, however, micromanage everyone or everyone to the same extent. They may micromanage certain individuals, some groups of individuals, a particular work group or some departments. Remember: micromanaging is not all-or-nothing; it is not a case of either you micromanage or you don’t. There are levels of micromanagement. 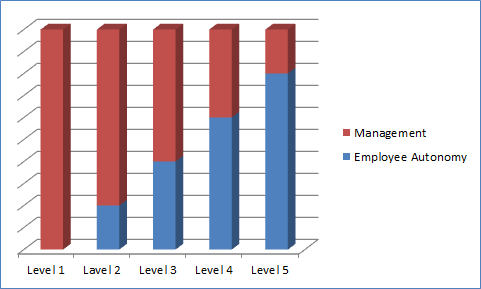 Check out Micromanagers are Like Vampires for the different levels of micromanagement. Identify who you actually micromanage – and create a list. Just as some managers micromanage everyone while others do not, some managers micromanage everything while others only micromanage some work, certain processes, or particular projects. For each of the people and groups on your micromanaging list, identify specifically what they do that you micromanage. While there are all-the-time micromanagers, some managers micromanage more at certain times than at others. At times, this makes some sense—like a former client in a finance group who only micromanaged near the end of each quarter as deadlines loomed. There are times, however, when the timing makes no sense at all – like a former client who only micromanaged in the morning. Seriously. Yes, I agree. That is a bit bizarre. For each of the people and groups on your list, identify when you micromanage them. All the time? At certain times of the day, week, month or quarter? Micromanaging behavior can also be triggered by place—different geographies or facilities. There are people who manage teams that are spread out across different regions who micromanage their workers in one region differently than those in others. Some managers manage the same person very differently depending upon where they happen to be working at the time. A CEO I know has two teams doing roughly the same work, one in the USA and one in his home country. He consistently micromanages the USA-based team but gives the team in his home country a great deal of independence. A former client told me that her manager gave her a great deal of independence as long as she was working in the executive office building; but her work frequently took her to another company facility—and when it did, he became a micromanaging ogre. Another client loved going on business trips because as soon as he was out of town his director stopped micromanaging him. For each of the people and groups on your list, identify where you micromanage them. Sometimes it is personality—they just need to be in control—and the pressure to succeed drives them to increase that control. Some managers truly believe that no one else knows as much as they do, is as talented as they are or can do a job as well as they can. Other managers lack confidence in their ability to manage in any other way (which is not surprising since so few managers today receive training to be either managers or leaders). When challenges and pressures grow, so does their anxiety over their ability to manage—and they work all the harder to maintain control. Sometimes micromanagers have risen up in an organization but struggle to let go of their old job because that is their comfort zone. Perhaps they think the person who replaced them isn’t good enough. They may know that they need to let go of the old job, but their replacement is not as experienced so they get involved and undermine the confidence and authority of their people. There are managers who use micromanagement as a tool to terminate an employee. They create standards that an employee is unable to meet and then feel justified in terminating the employee—instead of implementing a performance program to honestly measure an employee’s performance. For each of the people and groups on your list, identify why you micromanage them. Now look for patterns in your answers to the 5 Ws. The patterns will help you understand your micromanaging behavior. The patterns tell you what triggers your micromanaging, give you an idea of what you really need to work on and where you may need to get some help to stop micromanaging. A marketing consultant I know posted on his Facebook page today: “Always wonder why some CEOs would rather diddle with things on a web page or other marketing minutia than deal with really important business strategy issues or building a company team.” While I know this was more an expression of his current frustration with a client than a real question, it got me thinking—and I suspect the answer may be relatively simple: Entrepreneurs stay in startup mode too long. Entrepreneurs are by nature doers, and while in startup mode they are directly involved in just about every aspect of their companies. That is how their companies are born, succeed and grow. As a company grows, however, its leadership needs change, and some entrepreneurs have trouble shifting gears. They find it difficult to shift from doing to leading, and so they become stuck micromanaging. The problem is that micromanaging by a CEO can mean the downfall of a young company. Having control makes people happy; but employees who are micromanaged rarely feel they have control over their work. Unhappy employees are less productive and less creative than are happy employees. Micromanagement tells employees that you do not trust their work and judgment. When they realize that you are not listening to them, they shut down, stop making suggestions, and stop being straight with you. Micromanaged employees become disengaged. They resent your role as manager and do not become proficient at doing their jobs. They lose the willingness to make sacrifices; they put in time but little else. Their apathy is contagious, affecting not only their own productivity but also that of their colleagues. Micromanaged employees become confused and angry, and they suddenly quit, going work for another company. Additionally, the more that CEOs micromanage, the less time and energy they have to give to the critical work of a CEO. If a CEO focuses on tactics, then no one is attending to vision, direction and strategy. If a CEO keeps busy with day-to-day operations, then no one is taking the long-range perspective. If a CEO is spending time telling employees exactly how to do their jobs, then no one is inspiring and motivating them or building a company team. Are You a Micromanaging CEO? One antidote to micromanaging is learning to delegate. Delegation is a critical skill both for personal success and for the success of the company you lead, and I have written before about the importance of delegating and about what delegating is and what it isn’t (Are You a Work Hoarder; The Beginning Delegator; and Know Why You are Delegating). Like any other leadership skill, you can’t acquire it by reading a book (Leadership is Like Skiing: You Can’t Learn It by Reading a Book). You might intellectually understand delegating after reading a book or an article, but that doesn’t mean you can do it. You have to unlearn old habits, default reactions, and assumptions about human nature in order to adopt new and different choices and behaviors. That takes time and effort—and you may need someone to help you. Even though it may take some time for you to develop your delegating skills, that doesn’t mean there isn’t anything you can do in the meanwhile. Here are three simple (but still challenging) things you can do to start curtailing your micromanaging.